What do you do when you're an underachiever at home? You go to Berlin to become an underachiever there. At least that's true for thousands of "creatives" who flock to the German capital every year. They are mostly young Italians looking for success in times of crisis and, together with those who came as guest workers in the 1970s, they form the third-largest migrant community. One of them is Alessandro Cassigoli, who joins Tania Masi from Florence and cinematographer William Chicarelli from Brazil on an Italian journey through Berlin to cope with his homesickness. That at least should be done with at the end. For what could you possibly long for here, when original Italian mozzarella cheese is actually produced in Berlin and the Italian owner of the pizzeria around the corner comes from Bosnia. The much more important question is how to endure those Germans who only eat to fill their stomachs, always want to discuss everything, and ride bicycles to boot. 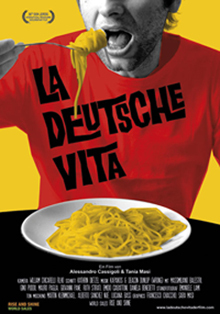 In a wild ride through every Italian and German stereotype (it's all true!) you don't just feel that you're in a Fellini film (on speed), you also find the familiar mirrored in the foreign. Big issues like migration, identity, crisis, and globalisation are taken up almost in passing. Italians abroad cope with them in their own way: "This is the room where Mama will live."